Sheet Pasting Machines, Sheet Pressing Machines, Sheet Pasting Machines Manufacturer, Sheet Pressing Machines Manufacturer, India. 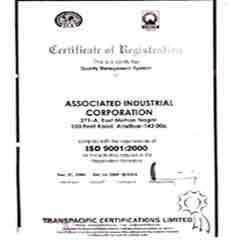 We Associated Industrial Corporation, was established in the year 1979, and are led by Mr. Kuldeep Singh. With his visionary ideas he has guided us to emerge with innovative ideas. His extensive industry experience and business sense has enabled us to produce well designed products using state of art manufacturing process. Being technically advanced we have fabricated flaw less product range which include corrugated board & box making machines, binding machines, die cutting creasing & embossing machines, stitching machines, lamination machines, sheet pasting machines, sheet pressing machines. Our range of products have largely gained popularity as we also offer customized solutions to our clients. The machines are manufactured and configured according to the requirements of the clients. To keep pace with the ever increasing demands of our customers we have upgraded our workstation with latest technology. Further, we also provide packaging and delivery services as per the clients order. Over the years we have served our clients with wide array of machines which cater to the needs of varied industries. Apart from this we also provide other services to our clients. We provide packaging and delivering facilities for the convenience of the customers and as per their order. This helps us on time and safe delivery of our products. Our services are not just limited to the production and delivery of machines. We also provide after sales services to our clients which aids them in the installing and use of our precision engineered machines. With our quality and dedicated services to our clients we have emerged as a reputed company and gained a large number of clients. With our range of machines we have emerged as one of the renowned companies in the industry. This has also enabled us to serve a wide array of industrial purposes ranging from die cutting, embossing, lamination, box making, barrel making and other industrial purposes. With varied services we have catered to a wide field of industries like ancillary & packaging industries. Hence we have clients spread over India. Dominating the Indian market in this sector we have also delivered our services to our clients abroad. Some of our eminent clients who have acclaimed our services are spread over Africa, The Gulf countries, Iran, Bangladesh and Sri Lanka. Our team of workers has largely contributed to the production of our company. With their extensive industry experience we have created working solutions. They are qualified and proficient in their particular field. We have our team of technicians and engineers who monitor the whole process of manufacturing. They are skilled in their work and are provided with all the necessary training to use latest technology. This adds to the smooth working and increased production of the company.